ISTANBUL, Turkey -- They have lived for almost a thousand years around the remains of Istanbul's Byzantine walls, but when the time came to remove them, the Gypsies of Sulukule claim that they only found out about their intended future from the journalists flocking to their shantytowns to cover the story. "We heard from the media that the neighborhood would be destroyed to make way for residential developments," said Mehmet Asim Hallaq, 55, a spokesman for the ongoing campaign opposing the removal. "This is a kind of aesthetic assimilation they're trying to impose on us." Istanbul's Gypsies have lived in Sulukule ever since their Roma ancestors arrived in Constantinople, the capital of Byzantium, in the 11th century. Their presence is recorded in sources that describe how they lived in black tents, practicing fortune telling, playing music and dancing at the city's feasts. When Istanbul fell to the Ottoman conquerors in 1453, it was the Sulukule Gate that was first breached, while many of the Ottoman cannons and other artillery were forged by the contingents of Roma metal workers and smiths that were part of the Ottoman army. Today, the descendants of the Roma protest that they are the targets of discrimination and highlight the attempt to oust them from Sulukule as proof. Thinking creatively, they have taken their campaign to the Internet and hold weekly media-friendly cultural events in Sulukule intended to keep their plight in the news and generating headlines. 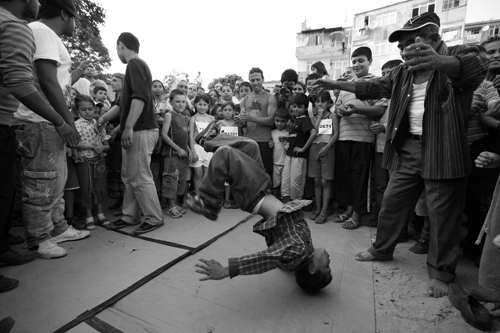 One weekend, as the photos below document, included breakdancing by Roma youth. Istanbul is in the throes of massive redevelopment, as Turkey's Prime Minister Tayyip Erdogan, a former mayor of the city, seeks to transform it into a regional tourist and financial hub. Massive commercial projects are springing up along Istanbul's coastline, with luxury residential apartments, a cruise docking area and an "Ottoman-style market" being constructed in one port area. In the financial district of Levent, UAE construction company Emaar is embarking on a skyscraper project called "Dubai Towers - Istanbul." It is all part of what locals call the "Dubaification of Istanbul." 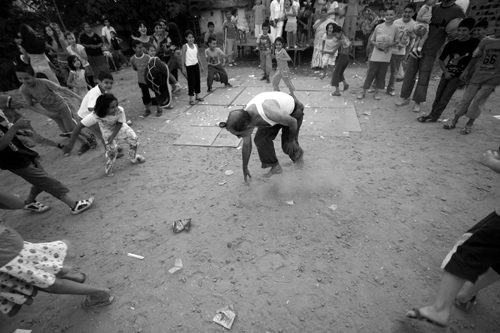 In response, the Roma dance to preserve their neighborhood. 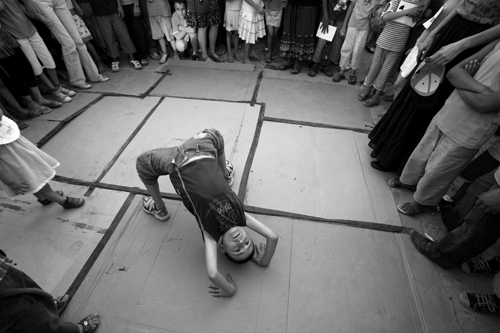 A young boy performs a breathtaking head stand during a breakdance jam session. 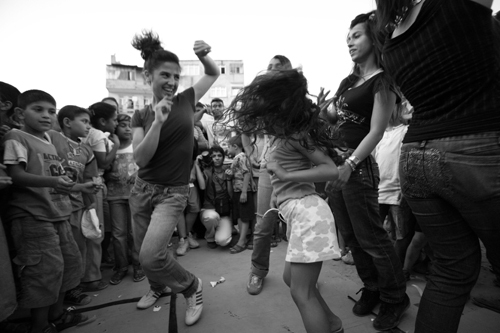 Young girls dance spontaneously in the middle of a circle of onlookers. 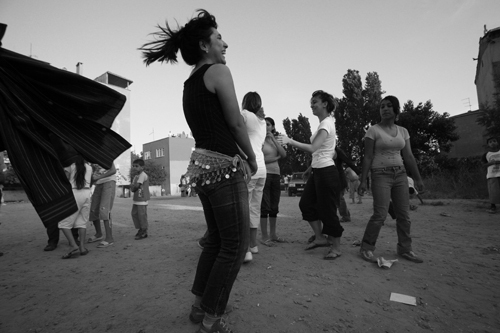 Gypsy women are one of the few female groups in the Middle East that are permitted by their culture to dance in public. A teenage girl laughs as she dances in an open space in the middle of the Solukule neighborhood. 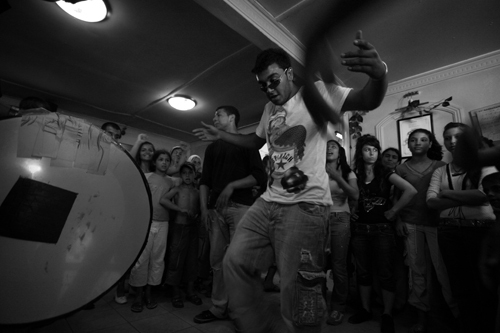 Gypsy youths mix breakdancing and traditional instruments such as the drum during a freestyle session. A young child takes advantage of a lull in the festivities to draw onlookers' attention. Children scramble to escape from a mentally disturbed local man. Iason Athanasiadis is a freelance writer and photographer currently living in Istanbul.